Growing orchids in a greenhouse is an exciting challenge and can be a very rewarding experience. With a little planning you can build your dream greenhouse where you can show off your beautiful orchid collection to your family and friends. In terms of orchid greenhouses…what are my options? (1) The first type is a Lean-to which is typically small with one of its long sides against the house to which it’s attached. Lean-to’s are generally inexpensive and aren’t as easy to control temperature-wise as other greenhouse types. 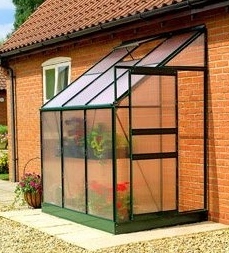 (2) The second type of greenhouse is attached or connected to your home. These are typically larger than lean-to’s and are also easier to control the temperature and ventilation in. (3) The third type of greenhouse to consider is a freestanding greenhouse which is not connected to anything. Depending on what size you would like to build, these types of greenhouses can be pretty pricy, but they do offer the best light, temperature, and ventilation control. I’ve decided on my greenhouse type…now what? After choosing the type of greenhouse you want to get, the next step is deciding on the perfect location where your greenhouse can get the perfect amount of sunlight. There are a few things you need to take into consideration when deciding on a spot. You will not want to place the greenhouse on the north side of your home because it will be too cold in the wintertime, and you need to be careful to make sure that the location you choose doesn’t have midday sun blocked by trees or other large structures. Some of the ideal locations are: north-south, east-west, or southeast-northeast. If you’ve decided on a freestanding greenhouses, they do well when oriented north-south, where as lean-to’s and attached greenhouses do well when oriented east or south so that they are able to receive maximum exposure. Something else you may want to consider when finding the perfect location for your greenhouse is ease of access to a water faucet. There are several ways to control the temperature in a greenhouse. You may want to keep a thermometer inside your greenhouse at all times so that you can closely monitor the temperature to make sure that your orchids are not getting too hot or too cold. A heating system is essential if you live an area where the temperature falls below 45°F (7.2°C). There are many different heating options including steam, solar, circulating hot water, natural gas, and several others. On the other hand, unless you live in an extremely hot area or you are growing cool-temperature orchids, you probably won’t need any type of cooling system. It is also very important to make sure your orchids are getting enough ventilation. This is important so that your orchids do not develop root rot and disease. You can achieve the proper amount of ventilation with oscillating fans, or built-in vents along the sides and roof of the greenhouse. In order to be successful in growing greenhouse orchids, you will need to provide the proper humidity levels. In order to increase the level of humidity in your greenhouse you can either install a humidity unit or install misters which work on a timer. 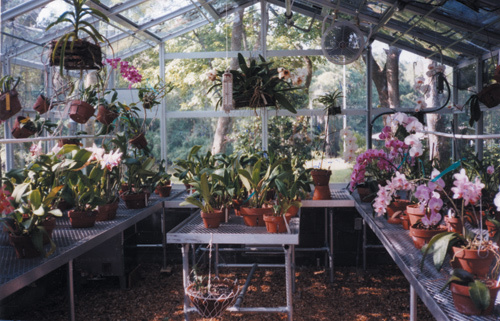 There are many different ways that you can display your orchids in a greenhouse. One of these ways is to get a bench to display the orchids on. These benches can be made of all kinds of materials such as plastic, wood, or steel. It is important to remember when choosing a bench to get one that has the ability to provide adequate air flow to the roots and one that also will allow proper drainage so that the orchid’s roots aren’t ever sitting in a puddle of water. Benches can be single, double, or triple-tiered. If you decide on a multi-tiered bench you will need to make sure to keep only the orchids that are low-light on the bottom because not very much light will be able to reach those orchids. Also, a water deflector tray is important so that water doesn’t drip from the orchids on the top down to the bottom-tired orchids because this is a good way to get crown rot or spread disease. Another way to display your orchids can be to hang them up, especially if you grow Vanda orchids which have a very long root system. You can hang your orchids from pots, baskets, or attach a mounted display to the wall using wire or mesh. Because you are able to control the amount of light, temperature, humidity, and air movement much more easily in a greenhouse than in your home, growing orchids in a greenhouse can be much easier for many people. Growing a greenhouse orchid can be a very gratifying experience when you are rewarded with beautiful orchid blooms.